Growing up in Australia, you quickly learn from a young age that you should respect certain things about the sometimes harsh nature of our country. Our beaches are famously beautiful, but you had better know what you're doing before you head out for a swim - jump in on the wrong stretch and you could quickly get into strife. We also have a reputation for housing some pretty dangerous animals, but that is generally overblown, with most people living in the cities really only having to mind about the odd poisonous spider here and there. Then we have the bush. The wild outback, where kangaroo and emu roam under an enormous sky and over vast plains of red dirt and eucalyptus trees. Staggeringly beautiful in parts, drivers will travel across huge expanses of land in sweltering temperatures to see parts of the country that most tourists will miss - but if they break down, they can quickly find themselves in deep trouble. So you learn a few things. You learn to swim between the flags, to tap your boots out every time you put them on to shake out any spiders, and that if you're going bush, that your best bet is driving something with a Toyota badge on it. You've got to remember that Australia is the third least densely populated country (behind Namibia and Mongolia) in the world. There's a heck of a lot of open space to explore, but with with very little help to come by if you break down on some remote dirt road with no reception. It's not so much about what vehicle can get you there, as much as the vehicle that gives you the best odds of getting back home. 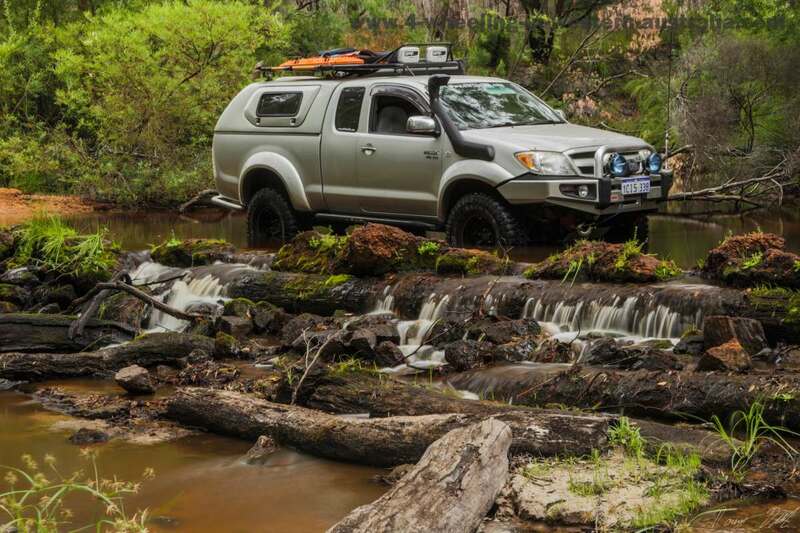 There are plenty that opt to go with beefed up 4x4 Hilux Utes with a canopy over the tray for a place to sleep, or a tent on the roof racks if they are hauling a lot of gear in the back. Heck, even the Northern Territory Police (who police some of the most remote communities in the country) run Hilux Utes with a cage in the tray for hauling naughty locals back to the station. Although the Hilux has an incredible reputation for reliability and durability, it still isn't the top dog in the Toyota brand in terms of ubiquitous presence in Australian farms and far-flung offroad tracks. That crown is still - as it has always been - worn by the Land Cruiser. I saw it when I lived in the UAE too - wherever I ventured into the wilderness there they were. From the rocky coastal terrain of Oman to the deserts of Dubai and Abu Dhabi, locals and tour groups would trust their Land Cruisers to navigate the harsh environments comfortably, and see them home safely. The modern Land Cruiser is a gargantuan beast, and while still reliable and a truly capable offroad vehicle, it strikes me as bloated and devoid of any charm in the design, so I struggle to get excited about it. Trace back in time through the Land Cruiser heritage though, and I quickly start thinking about what I would have to sell off in order to add an older one to my driveway. The sweet spot for me has always been the FJ40. Utterly charming, perfectly proportioned, and incredibly capable, the FJ40 debuted in 1960 and was a huge success. It married the utilitarian nature of the original military inspired Land Cruisers that Toyota built in the early fifties with gorgeous styling, low range gearing, and a new 3.9-liter six-cylinder "F" engine, and this more civilian friendly version struck a chord with hundreds of thousands of buyers. It became the best selling Toyota in the United States for four years in a row in the early sixties and would go on to become an icon for the brand. These days, you are unlikely to find stunning examples like the car pictured being tested to the limit offroad, as high quality restored examples are now finding their way into collectors hands and the prices are getting to surprisingly high levels. Earlier this year a beautiful 1977 FJ40 was auctioned off in Arizona for over $100,000 - and it looks like someone else is willing to see if collectors still have the appetite to pay similar money for this example. It will go under RM Auctions hammer in January next year, no specifics are given at the moment but check this page closer to the date if you are interested in more information on this particular car. For those that are still after some more FJ40 content, here is Motor Trend with their Generation Gap segment where they compare the original Willys Jeep to our featured car to see which comes out on top.